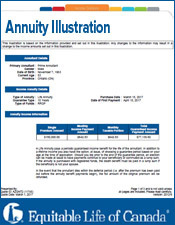 What is an annuity due? 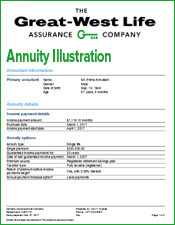 An annuity due is almost identical to a regular annuity. When you buy an annuity due contract, you make a deposit with an annuity company. In exchange for your investment, the annuity company agrees to give you monthly payments in the future. 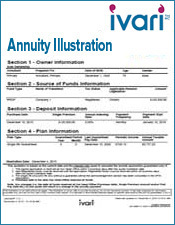 The main feature of an annuity due is the timing of its payments. 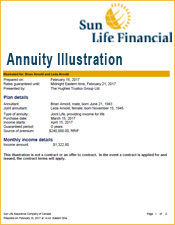 A regular annuity makes its payments at the end of a period. 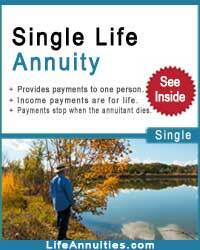 If you have a regular, monthly annuity, you get your payment at the end of the month. 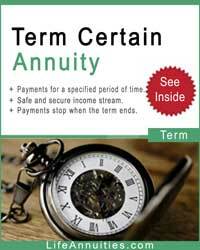 An annuity due makes its payments at the beginning of the period. As a result, you receive your payment on the first day of each month. 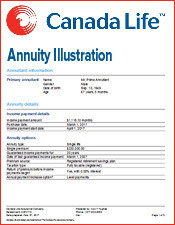 Canadian annuity companies sometimes offer products with an annuity due payment structure. 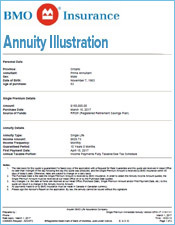 An annuity due is a slight variation on a regular annuity. It has a different payment structure so this changes the value of your annuity contract. 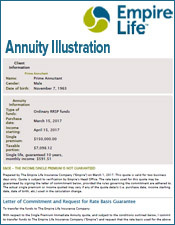 This article discusses the features on an annuity due, how it is different from a regular annuity, and how our free annuity due calculator can help calculate the value of an annuity due. The tables below show a premium amount of $100,000 registered funds with a purchase date June 1, 2012 & Start date June 1, 2012. Monthly income are listed below by age group. Monthly annuity due table rates as of May 1, 2012. Annuity rates may have changed since the table was last updated, to get up to date annuity rates please use our annuity due calculator. If you are looking for an annuity due contract, our free annuity due calculator can be a big help. 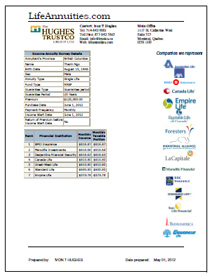 Our company has access to the annuity databases of the best companies in Canada. With this information, we can build the exact same annuity due quotes that you would receive from an agent. While it can take weeks to collect quotes from company agents, our annuity due calculator builds your quotes within a few days. 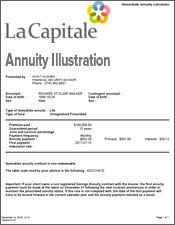 This tool finds free annuity due quotes from the best annuity companies in Canada. Using the calculator takes only a few minutes and is completely free of charge. 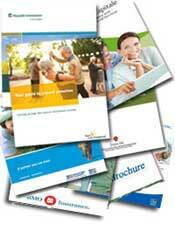 To find your annuity due quotes, you simply need to enter in a few pieces of information into the program. You need to enter in your age, your gender, the amount you want to invest, and how long you want your contract to last. 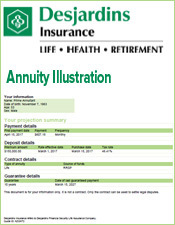 The calculator will search the annuity databases of the major annuity companies and put together multiple free quotes. 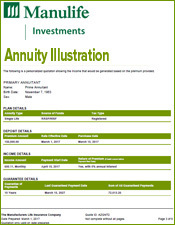 This information lets you find the highest paying annuity due contract for your deposit. You can receive your free quotes by email or by a phone call from one of our agents. Annuity rates can differ significantly between companies. Taking the time to compare all your options with our annuity due calculator can make a big difference in your income during retirement. The difference in the timing of payments makes a few small differences between an annuity due and an ordinary annuity. The annuity due makes its payments earlier than an ordinary annuity so you don’t have to wait as long to get your money. 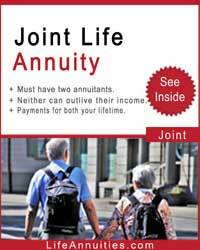 Since the annuity due pays out earlier, it also has less time to invest your money. This means you receive a slightly smaller monthly payout from an annuity due than you would with an ordinary annuity. 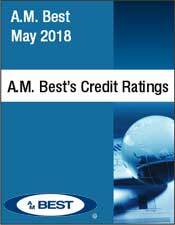 The key difference between an ordinary annuity and an annuity due is that the annuity due has earlier, but smaller payments than the ordinary annuity. Is an Annuity Due Better? Whether an annuity due is better depends on your monthly budget. When do you need your first monthly payment? If you are investing all your savings into an annuity and need a payment immediately, an annuity due is clearly better. If you have enough extra cash to delay your payment a month, you may be better off with the higher payments of an ordinary annuity. In addition, look at when your monthly bills are due. You should try to match your annuity payment to the due date of your bills. This helps you pay off your bills immediately and reduces the chance that you may mismanage your money. If your bills are due at the start of the month, choose an annuity due. If your bills are due at the end of the month, choose a regular annuity. 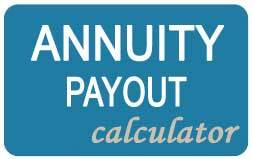 Our website also offers a few calculators that analyze annuity due contracts. If you have received an annuity quote from a company and want to compare its value to other investments, you should use the present value of an annuity due calculator. 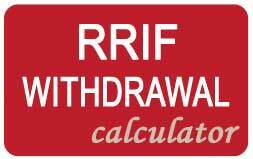 This calculator finds the investment return of an annuity due. Typically, an annuity due quote lists the amount paid per month, the length of payments, and the amount you need to invest. 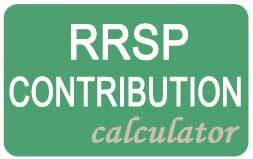 If you plug this information into the present value of an annuity due calculator, it will tell you the annual return of your contract. By comparing this return to the annual return of other possible investments, you can decide if your current contract is a good deal or if you should invest your money somewhere else. Annuities can be good investments for young investors as well. If you invest in a deferred annuity, your entire annuity balance is invested and you delay monthly payments to the future. While you are building your annuity balance, you can elect to make monthly deposits into your contract. When you decide to retire, you annuity company will pay you back your deposit plus investment gains through monthly payments. If you choose to make deposits at the start of the month, you choose to invest in an annuity due. If you choose to make deposits at the end of the month, you choose to invest in an ordinary annuity. Before you start investing monthly in an annuity, you should research how well this investment will perform over time. This is where the future value of an annuity due calculator comes in. If you enter in the size of your monthly payment, the promised annual return of the annuity, and the number of months you plan to invest, the future value of an annuity calculator will tell you exactly how much money you will have in your account at retirement. You can compare this figure with the expected results of your other retirement options to find the best place for your money. 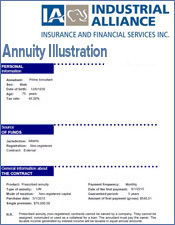 Our company has access to the annuity databases of the best companies in Canada. We provide annuity quotes from all the insurance companies that sell annuities; so there is no need to have to shop anywhere else. You'll get the best monthly income available. Here is an example of an annuity due quote you can expect to receive. 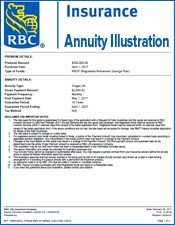 To receive your instant, no-obligation annuity due quote, use the annuity calculator provided. Please complete the form below. You will receive an email within 24 hours.